The Republic of Ireland star scored her side's third goal of the night. REPUBLIC OF IRELAND captain Katie McCabe was on target for Arsenal as they scored an emphatic win over Bristol City in the Women’s Super League, to cut the gap on leaders Man City. McCabe scored her side’s third goal of the game on the way to a 4-0 victory at Meadow Park which leaves them within two points of Man City at the summit of the table. The Ireland star got on the end of a perfect pass from Netherland’s Dominique Bloodworth, who lobbed the ball into the Bristol box where McCabe was waiting. The Dubliner controlled the ball well with her left foot before slipping the ball past the Bristol keeper from close range. 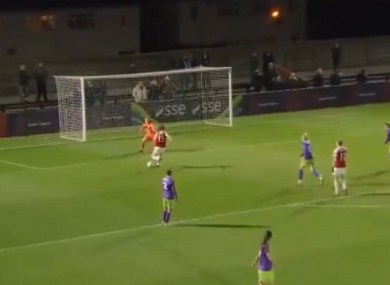 McCabe’s goal, coupled with Vivianne Miedema’s third hat-trick of the season, secured the victory for Arsenal to keep them firmly in the title race with two games in hand. They now have the chance to climb up to top spot when they face Liverpool on 24 March. Email “Ireland skipper on target as Arsenal score huge win to cut gap on league leaders Man City”. Feedback on “Ireland skipper on target as Arsenal score huge win to cut gap on league leaders Man City”.